Singapore, an island city-state in Southeast Asia, is one of the most beautiful cities in the world. A perfect amalgamation of modernized buildings and breathtaking natural beauty, it is an ideal place to spend your holiday. This is why thousands of people from around the world choose Singapore as their holiday destination. Moreover, Singapore is also a global financial center, which brings a lot of businessmen to the city regularly. While the city may look modern and westernized, there are several common etiquette associated with the people and culture in Singapore. Tourists and businessmen visiting Singapore should know about them so as not to do something that is offensive to the people of Singapore. Singapore is a multi-ethnic city where you would find people of Chinese, Malay and Indian origins. Each of these communities has different cultural etiquette. Here we will take a look at them. Communication: Mandarin Chinese, Malay, English and Tamil are the official languages of Singapore. You would find Singaporeans to be soft-spoken. They would not directly look into the eye while speaking, especially if they are talking to a person of higher stature. This is considered to be an act of respect. Apart from this, the people in Singapore think before talking or replying. Do not be surprised if the person pauses for 10-15 seconds before replying to a question you have asked. Make sure that you do not interrupt their silence. Hitting your fist into your cupped hand is considered to be an obscene gesture. Yawning openly, blowing your nose and clearing your throat in public are considered to be rude. Refrain from putting your hands on your hips while talking to a person, unless you want to offend him or her. If you want to call someone from a distance, do so by keeping your palm down and extending your hand. Flutter your finger lightly while doing so. Never point your fingers at anyone as this is considered extremely rude. Introduction and Greetings: Singaporeans have deep respect for their elderly, and it is important to acknowledge and introduce elderly people in a room first. When it comes to greeting people, shaking hands are most common, especially in business meetings. It is also ok for men and women to shake hands however the men should always wait for women to extend their hands first. If they do not, it is best to greet them with a bow. The handshake need not be firm like it is expected in western countries. Gift Giving: Singaporeans have some gift giving etiquette that you must follow if you are giving a gift to someone there. It is best to avoid giving gifts like handkerchiefs, knives, clocks, scissors, straw sandals, cutting utensils, etc. The gifts should be wrapped in yellow, red and pink colors and wrapping paper of white, black and blue colors should be avoided as they are considered to be mourning colors. If you receive a gift from someone, do not open it in their presence. Gifts should be opened only after the guests have left. Avoid gifting flowers as they are associated with sickness and funeral. Whatever gift you give, ensure that the wrapping is elaborate. While the cultural etiquette are something that you need to know when you are visiting Singapore as a tourist, there are some etiquette that you have to know and follow if you are going to this city-state for business purposes. Punctuality is considered to be extremely important for Singaporeans. They consider arriving late as an insult. Hence, you must make it a point to arrive on time for business meetings. If you are going to be late, make it a point to inform beforehand. If you are planning to have a business meeting in Singapore, it is best to make your appointment weeks or even months before actually visiting the place. Carry as many visiting card as possible with you. Hand over your business cards when you meet the professionals for a meeting. When you received a visiting card, accept it with both hands and treat it with respect. Read it first and place it in the visiting card holder carefully. Do not slide it into a drawer or write on it carelessly. This is considered to be an insult by Singaporeans. Always begin your meeting with small talks. You may be asked about your family and such other personal things while getting to know you before the conversation turns into business. If you are invited for a business lunch or dinner, accept it and let your host decide the menu. It is imperative that you host a similar lunch or dinner, later. 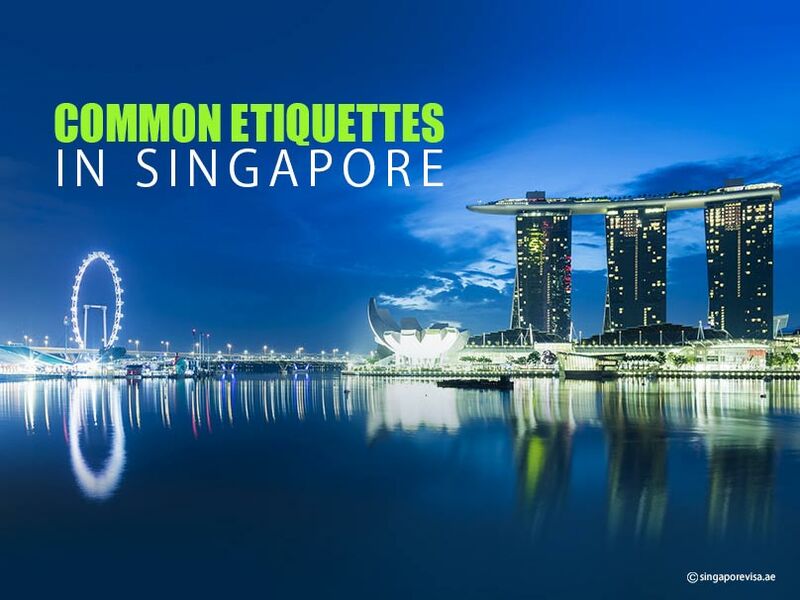 These are some of the common etiquette that you should follow when in Singapore. While these are not legally binding; however, following these would mean that you respect the culture of Singapore.